This Dead-headed Woodpecker was the first picture I took today. It looks mighty beautiful for a dead bird. And boring. However, what was not boring was my first Action/Sports Photography class tonight. Our professor shoots sports for the Washington Times. It was the best first day of any class I can remember. There are some very interesting techniques in sports photography. I learned a lot in just the first class. And I don't even care about the sports aspect, just the action. 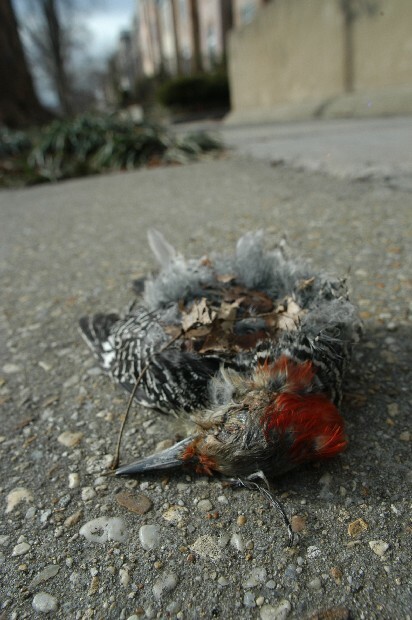 Sad thing is, after the email I recieved from my advisor today, I might be forced to drop the rest of the semester (Like this woodpecker dropped out of the sky) because of the personal problems I'll have linked with being treated unfairly and like crap. My computer has been on the blink. I haven't been able to run Photoshop for almost 2 months. My Instant Messanger went down a couple days ago. And my internet has been acting funny so I haven't been able to check my email the past couple days. Today, my first day of classes this semester, I checked my email. Yesterday, (aka the day before the first day of the semester) the Chair of Photography sent me an email. He was asking me to drop my studio lighting class ... after I have not only invested the $20,000 a semester to go to school, but also the recent Ebay purchase of over $1000 in studio lighting equipment specifically for the class! Upsetting. Very upsetting. It would just be starting off on the wrong foot. I'd have to take a semester off and think about how serious this learning institution actually was towards my education.